I have always wanted to write, but I don’t have time – I am far too busy reading. I love to read; I love stories – princesses in castles, knights in shining armour, people in far away places…because of this, my head is crammed full of other peoples stories and ideas, there is scarcely room left for an original thought of my own. Each book that I read becomes an adventure, a trip to a new world, and much, much more than that. A really good book leaves me wanting to know as much as possible about each person and place mentioned in it, and of course the amazing author that created it – thank goodness for Google! I spend hours pouring over Google maps to see where a story is based, looking at images of buildings mentions so that I can build up a really clear image of the place, I check out links to reality – everyday is quite literally ‘a school day’. If I can actually visit somewhere mentioned in a book even better – on a family adventure to Austria when I was 16, my birthday was spend exploring Achensee in North Tyrol. 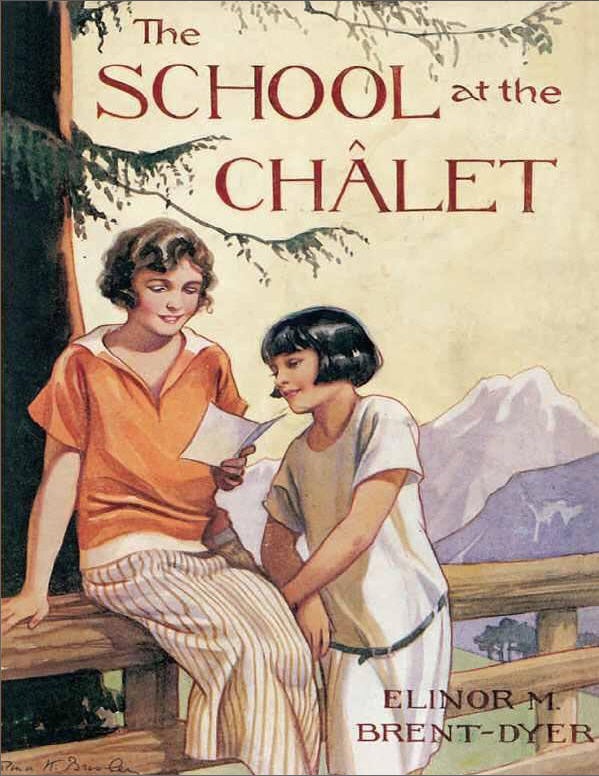 This is the beautiful, awe inspiring setting for Elinor Brent Dyer’s earliest Chalet School books. It was a day in a lifetime, something to tick off on my bucket list. When I returned to England, holiday over, I re-read every one of those books in a whole new light, able to fit the characters into the exact setting that Elinor had intended, not simply my interpretation of her wonderfully evocative writing. In testament to Elinor’s writing, it is so easy to locate her fictional landmarks in their real-life backdrop. Growing up, my inability to do anything without a book in one hand infuriated my family. On so many occasions my beloved book of the day/week would be wrested out of my hand by my poor mother at 8.45 as she shoved my out of the door and off to school. My lovely siblings (one of each & both younger) would grumble at breakfast time as they waited impatiently while I read the “new thing” on the back of the Sugar Puffs packet, lingering over the unfamiliar words in the list of ingredients. Did I mention that as well as books I love words? I love the way they sound, the way they look and the way a new word feels in your mouth when you say it for the first time – when I was younger this led to many odd conversations whereby a completely inappropriate word was used because it sounded nice! The advancement of technology has only enhanced my love of reading and has opened up a whole new world to explore. I have rarely in my life been out of the house without a book in my bag, but now, this is no longer a back breaking habit; a lot of my books are now downloaded to my phone. This does not mean that I do not read ‘real’ books anymore. Far from it. It just means that I have a more economically and ergonomically friendly way of accessing books that would otherwise remain on my ‘to read’ list for all eternity – those wonderful reduced price and often free classics that everyone should read, and tales by new unknown authors such as Denise Grover –Swank, author of the brilliant Rose Gardner series (if your looking for an easy read, laugh out loud romance with a twist, you really should check out ‘Twenty-eight and a Half Wishes’) . Nothing beats the feel and smell of a real book; where possible I have my favourite authors in ‘real’ books, all lined up nicely on my bookshelf – the majority are now hardback as I will pre-order months in advance, unable to wait patiently for the next instalment, my next fix! The arrival of these treasures, delivered by our long suffering postman are always greeted with the same sense of anticipation and excitement as a child on Christmas morning. Each is a new friend waiting to be discovered. These often huge, usually hardbacked buddies are still lugged around with me, just in case there might be spare moment in which I can catch a glimpse of the next page. My relationship with books has been lifelong. My first favourite books were The Garden Gang series by Jayne Fisher (the youngest author ever to write for Ladybird Books). My heroine was, of course, the “snooty and vain” Miss Penelope Strawberry; I was enthralled. Even now, over 30 years later I can still recite that now very battered first page and immediately I am transported to a sunny garden party. My choice of reading matter has at times been controversial – my poor reception class teacher battled to encourage me to read about “Roger Red-Hat” and his equally colourful companions. She was fighting a losing battle… I had discovered Heidi. How could a village of Three Corners with some hat obsessed occupants and a maximum of five words per page compete with the stunning Swiss Alps, a gentle Grandfather and a couple of goats? Imagine my delight when a year or two later someone presented my with a full length copy of Heidi. Books have shaped my life for as long as I can remember. Some books I read once, many I read over and over – you would not believe how many copies of ‘Wuthering Heights’ I have worked my way through, devouring each one until the pages no longer stay in the book. This blog will not be reviews of books; I am not qualified to judge the merits of a book. I have never written one, I am not an English major (my English literature teacher once wrote in a school report that I should read more – what she really meant was that I should read more of what she wanted me to read! ), and I have no right to pass judgement on anyone’s ability to write! This blog will be more about how books and the people and places related to them affect me personally, the emotions, thought processes and experiences that each one generates; it will not be about every book I read, it will be about the ones that I fall in love with and the things that I learn from them. I hope you enjoy reading, and I would love to hear your feedback.